I often start SEO from an existing website. Here are steps I always perform when starting the task. Then I go to Google and in the search box itself you type: site:thedomain Then hit enter. This will bring back the pages that Google has indexed. This will be critical to know so can later remove old URLs in Google’s Webmaster Tools, recrawl the site, and be up-to-date. This part can take a while so you have to consider this could double your time spent on the job, so be prepared to bill for it or you will be sorry. In Joomla you will need to set up the URL to be Search Engine Friendly. 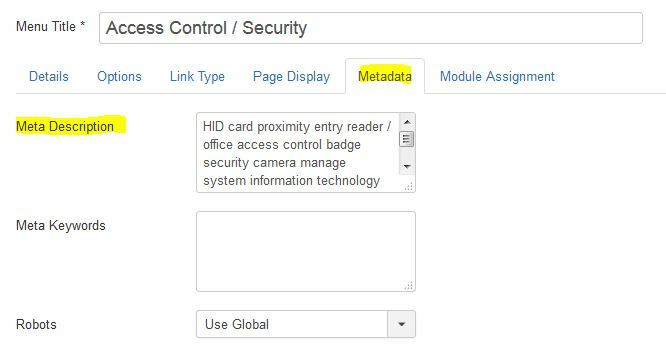 In the Administrator area go to Global Configuration >> Site >> Search Engine Friendly URLs ( turn this on), Use URL Rewriting ( turn this on). These changes will require you to change your htaccess.txt and change it to .htaccess. I don’t have it set to “yes” in my image below, but turning on “Add Suffix to URL” will give the page the “.html” at the end. I prefer to do a lot of the rest in the menu item. The “Browser Page Title” and the “Alias” is where item #2 from the above image will show. Staying in the Menu item I move over to the “Metadata” section to add my “Description”. This is part #3 in the upper image. Here I would rework my Excel spread sheet my making sure my new titles are less than “54” characters long and the description is less that 134 characters long. 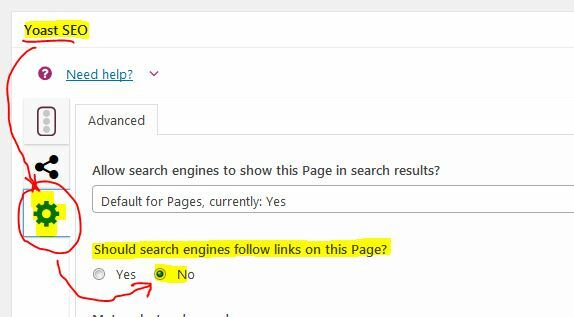 The name of the page should include the service or search term you want to use for that page. I use Wordcounter.net to determine how many characters I have in my new titles and descriptions. Next go into Google Webmaster Tools and remove the old URL’s that you won’t need anymore. Click the “Temporary Hide” button, put in the URL, and Google will do the rest. I don’t always add Sitemaps, but here is where you can do this in Google’s Webmaster Tools. I meet with NOVA JUG recently and the presenter Dorothy had a bunch to offer. Some of the plug-ins she mentioned. She also really talked up this book by Simon. For a security update the group discussed changing a setting to not send the password to a user in plain text. Listing a business with Google is a no-brainer. Google is such a one-stop-shop for looking something up. Of course you always want your business listing a close to the top a possible, so making sure you have your Google listing as complete as possible is to get some reviews. I have some customers that are low-tech, but want to use tech to get more business. I wanted to make it as easy as possible for a customer to be able to solicit their customers to leave a review. The customer did more landscape work; however, the business listing was under “construction”. 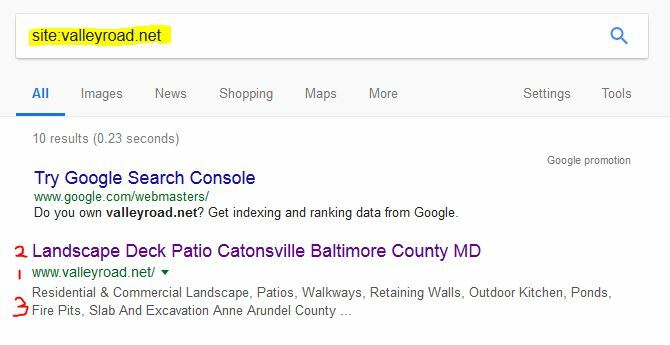 Searching for a landscaper in his area wasn’t yeilding results. This is relevant in case he wanted to tell the customer to look him up and review him. I found this great article about creating a tinyURL that will link the customer right to the screen they will need to review that business. Bring up that business listing. Click on the “Write a review” button. That’s it. Your client can send this TinyURL for the customer to quickly leave a review. This is my new favorite website. I love these the design pattern tiles. A Google search lead me to the following page which says it is a Yoast issue and will be resolved in the 8.1 update from Yoast. Working on new WordPress site using the Divi theme. I had found a video on creating a custom footer by creating a page and that page becomes an element you can save in your Divi library to be reused. I made a footer and added to each page. The problem came when I was reviewing the analytics after a month. “Footer” was one of the pages listed by Google and indexed by Google. I discover that I can disable search engines from tracking the Divi Elements / Pages. Go to that element / page. In my case it was the “Footer” element. This element is a page built with the Divi builder. This is what it looked like. 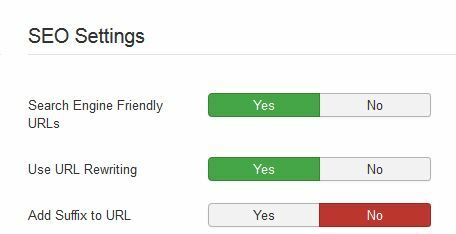 At the top of the page is my Yoast settings. There are 3 tabs on the left side. Click on the gear icon and you will see where to turn this off. I found this site and I want to give it a try. I needed to make a dropdown menu item in Ganty’s Hydrogen template 2 columns instead of 1 column. I did it once before, but I couldn’t remember. When I figured it out I made this video. The real benefit to Chronoforms is it is FREE. I start with installing both ChronoForms and CronoConnectivity from Chronoengine. Go into Chronoforms and create a form. I started one here for customers. I wanted to keep their name, website, and password list. I started with a form called Customers. After the designer elements of the form were finished I did not go into set up yet. 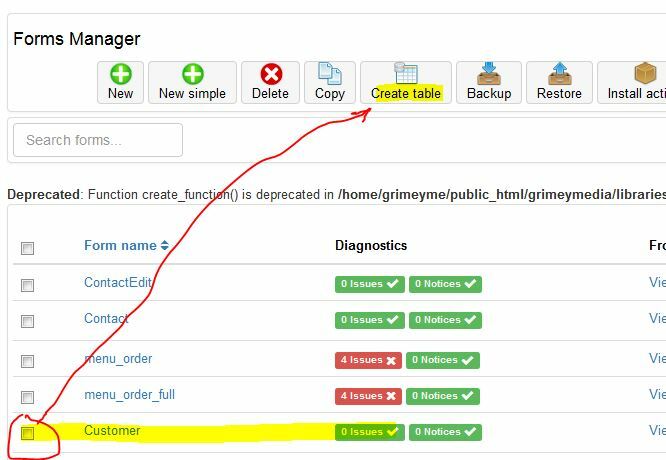 I went back to the “Forms Manager”, checked the “Customer” form and hit “Create table”. I ended up using the standard setting. Now I go back into the form and add a couple of pieces to the “Setup” tab. 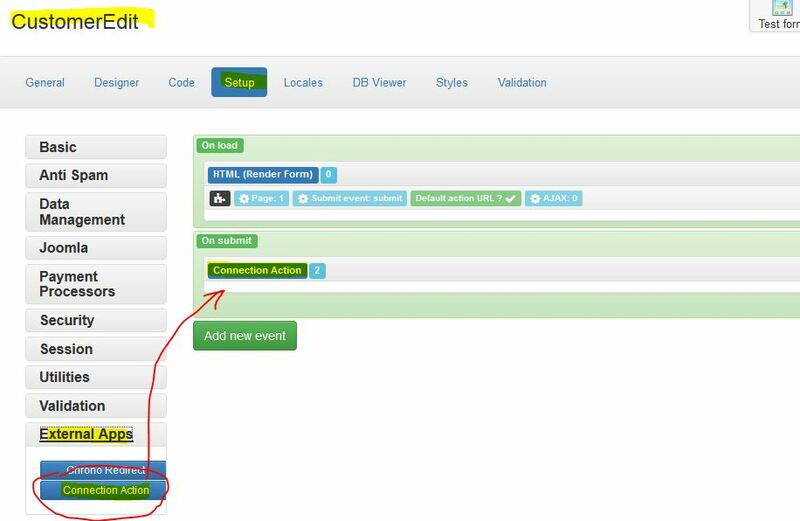 In the “on load” section add “HTML (Render Form)” and “on submit” area add a “DB Save” from the Data Management elements. You will now be saving the data to the database. In ChronoConnectivity click “New” credential Manager. I am calling mine “customeredit”. The Connection Name I called “customeredit”, and set published to “yes”. 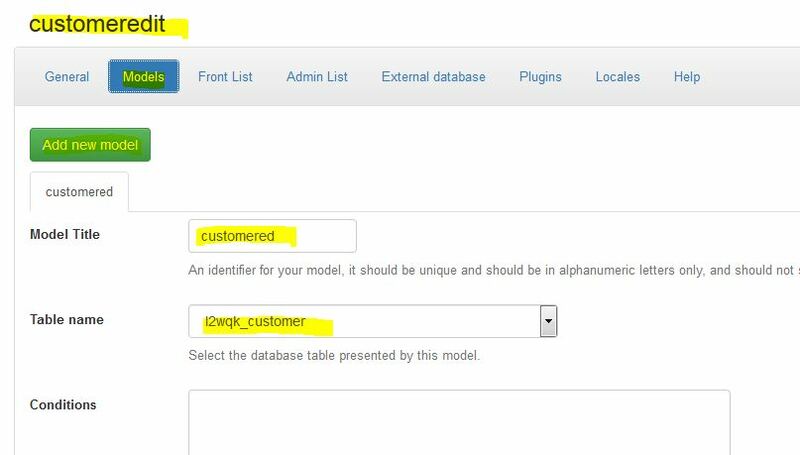 Next click on “Models” and enter a new Model. I titled mine “customered” for customer edit. Use the dropdown to select the table where you stored the data from the form. 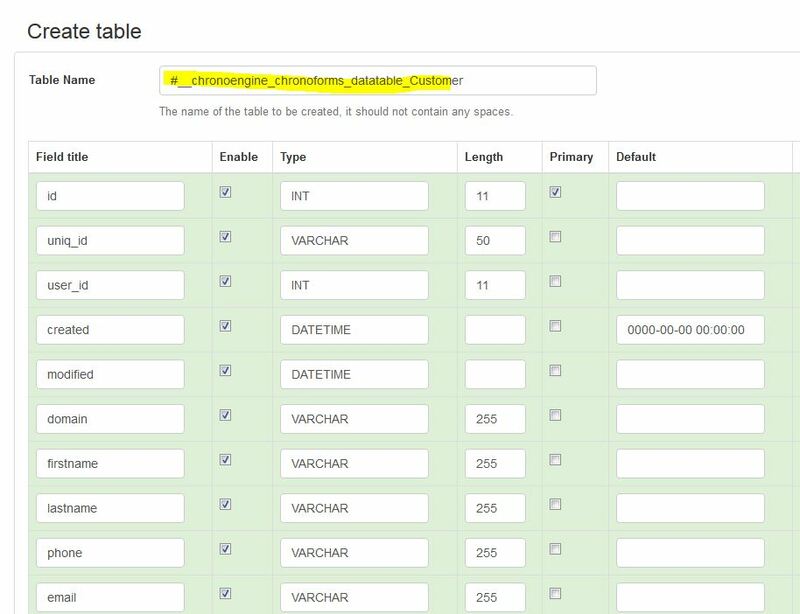 The “Sortables” allows this column to be sortable once it is displayed. On the “Actions” tab click “edit”. The form event will be the name of the form and the action. I called mine “CustomerEdit” and the action is “:load”. I don’t have this form created yet so we will do that next. Before we leave this connection we need to set it permissions and that is to make the “view” allowed for the public so we can see it. Go back to Chronoforms, check “Customer” our original form and hit the “Copy” button. Rename this copy “CustomerEdit”. This is what the the “Form event” is looking for. 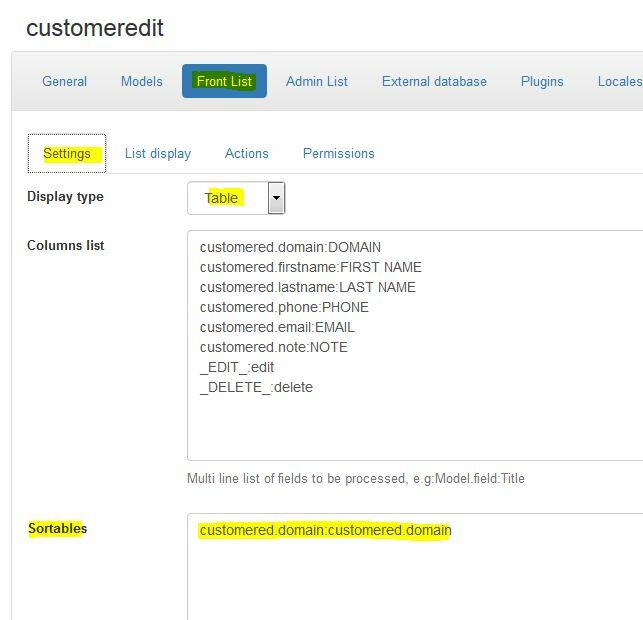 Click on the “Edit” button and set the “Field Name” and the “Field ID” for this “First Name” element to be “customered[firstname]”. 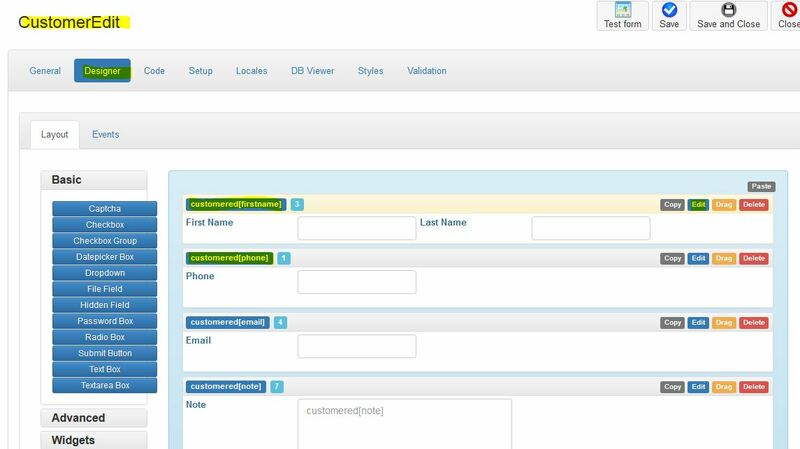 This will tie the data coming over to this form together, so the firstname parameter will fill in the “firstname” field. Do the same with the rest of the elements. I also put a hidden field to collect the ID number. Lastly add the name of the connection from ChronoConnectivity. I used the name “customeredit”. The Connection action is “save”. 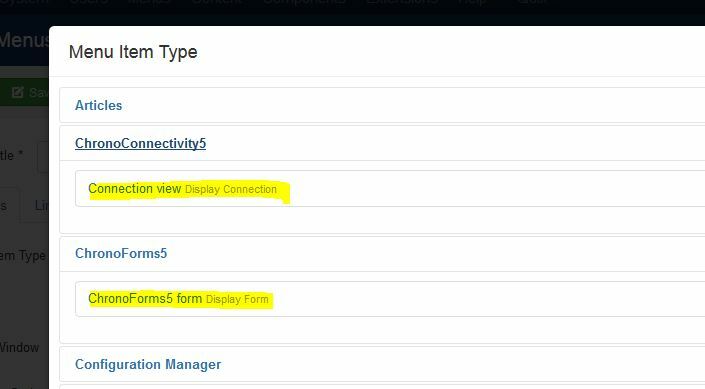 You can create a menu item for the Form and the Connectivity View to see it all in action . I will upload a zip file with the forms, connection, and database extract so you can use what I have working. It is easy to take my form and “Restore” it to your Chronoform and do the same thing with the Chrono Connection. The database table is easy to import a single table, and in my zip I have just the one table. I am working on a Chronoform / Connectivitiy version 6 tutorial. Version 5 wasn’t easy to understand and version 6 is looking to be just as complicated. Version 6 does handle the database input better. I recently wanted to install Joomla 4 Beta and discovered I need PHP 7 or higher. I am running XXAMP and only PHP 5.6. I also have WAMP installed and have a bunch of sites started in there. My WAMP would start; however, the sites couldn’t connect to the database. I looked in the “C:\WAMP\apps\myphpadminX.X.X\config.inc.php” file and the password was what I thought it was. I tried a bunch of things including using the MySQL Console but this article got me working again. 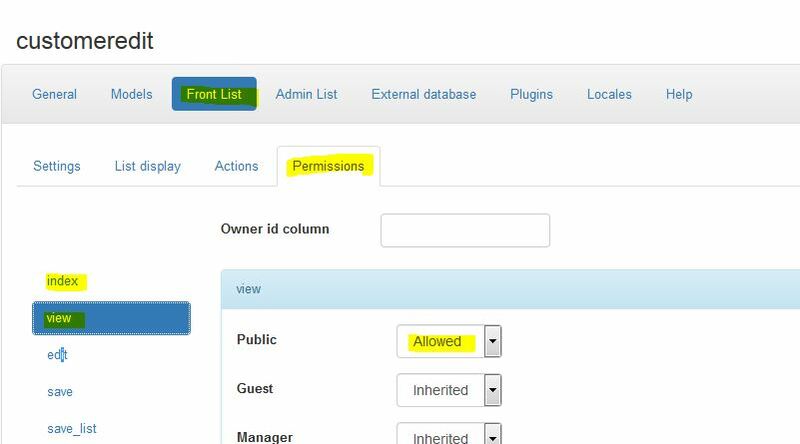 Restarted everything and I could log into PHPmyAdmin and all the sites were now connecting. I recently added Google Tag Manager for a customer and in experimenting I added to my company website. Now in FireFox I am getting a preview pane at the bottom of the page. In Chrome this can be turned off, but I couldn’t find how to do in Firefox till I found the following article. 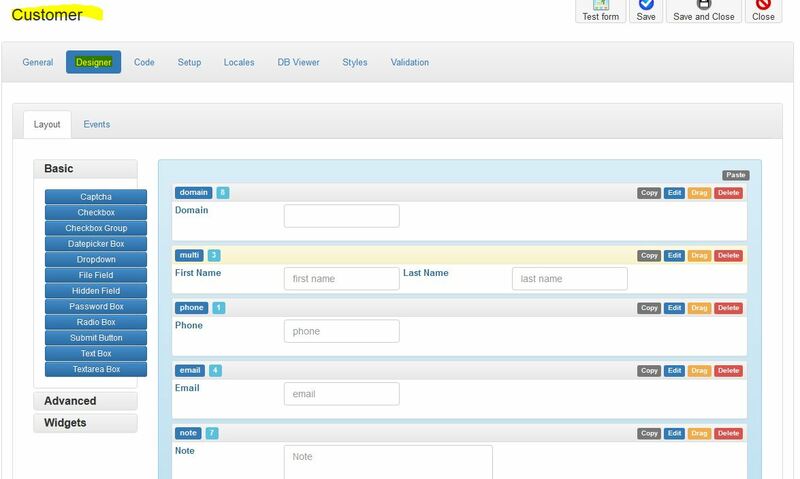 Log in to Google Tag Manager. Go to your site dashboard (Workspace < Overview). Click on the option that says Leave Preview Mode.